Chimeric antigen receptor (CAR) T cell therapy has come to the forefront of human cancer immunotherapy research. CD19-targeting CAR T cells (CARTs) have shown promising clinical efficacy against B cell malignancies, but prolonged CART persistence is required and can result in severe B cell aplasia/hypogammaglobulinemia. Ramos and colleagues of Baylor College of Medicine report the clinical safety and efficacy of κ-light chain-targeting CARTs (κ.CARTs), which limit B cell depletion by selectively destroying κ-expressing B cells but not λ-expressing B cells. In a Phase 1 clinical trial, 16 patients with κ+, relapsed/refractory non-Hodgkin lymphoma (NHL), chronic lymphocytic leukemia (CLL) or multiple myeloma (MM) were treated with one or more infusions of κ.CARTs. κ.CARTs reached maximum expansion 1-2 weeks after infusion and persisted for at least 6 weeks. Importantly, κ.CART infusions were well-tolerated, did not contribute to any of the reported adverse events, and in MM patients, produced a 50% reduction in circulating B cells with preferential depletion of κ+ cells. Four out of the nine NHL/CLL patients demonstrated clinical responses to κ.CART therapy, ranging from complete response to stable disease. Four out of the seven MM patients responded to therapy with stable disease, minimal residual disease, or improvement of disease symptoms. These patients received limited lymphodepleting chemotherapy and/or had CD19.CART-resistant disease, indicating the feasibility and potential advantages of κ.CART therapy. Taken together, the results of this study demonstrate that κ.CART-based treatment for B cell malignancies is clinically promising and has the potential to limit major, inherent adverse effects. 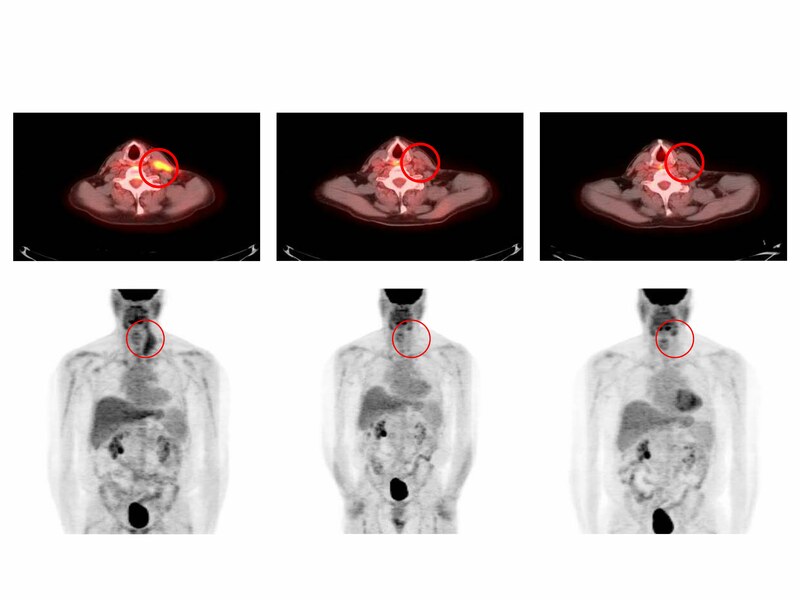 The accompanying image shows PET (upper panels)/CT (lower panels) images of a neck tumor mass in an NHL patient with complete response to κ.CART therapy. Note that the initial tumor (left panels) decreased in size 6 weeks after the first infusion (center panels) and was undetectable 6 weeks after the second infusion (right panels). Citation Information: J Clin Invest. 2016;126(7):2588-2596. https://doi.org/10.1172/JCI86000. BACKGROUND. Treatment of B cell malignancies with adoptive transfer of T cells with a CD19-specific chimeric antigen receptor (CAR) shows remarkable clinical efficacy. However, long-term persistence of T cells targeting CD19, a pan–B cell marker, also depletes normal B cells and causes severe hypogammaglobulinemia. Here, we developed a strategy to target B cell malignancies more selectively by taking advantage of B cell light Ig chain restriction. We generated a CAR that is specific for the κ light chain (κ.CAR) and therefore recognizes κ-restricted cells and spares the normal B cells expressing the nontargeted λ light chain, thus potentially minimizing humoral immunity impairment. METHODS. We conducted a phase 1 clinical trial and treated 16 patients with relapsed or refractory κ+ non-Hodgkin lymphoma/chronic lymphocytic leukemia (NHL/CLL) or multiple myeloma (MM) with autologous T cells genetically modified to express κ.CAR (κ.CARTs). Other treatments were discontinued in 11 of the 16 patients at least 4 weeks prior to T cell infusion. Six patients without lymphopenia received 12.5 mg/kg cyclophosphamide 4 days before κ.CART infusion (0.2 × 108 to 2 × 108 κ.CARTs/m2). No other lymphodepletion was used. RESULTS. κ.CART expansion peaked 1–2 weeks after infusion, and cells remained detectable for more than 6 weeks. Of 9 patients with relapsed NHL or CLL, 2 entered complete remission after 2 and 3 infusions of κ.CARTs, and 1 had a partial response. Of 7 patients with MM, 4 had stable disease lasting 2–17 months. No toxicities attributable to κ.CARTs were observed. CONCLUSION. κ.CART infusion is feasible and safe and can lead to complete clinical responses. FUNDING. National Cancer Institute (NCI) grants 3P50CA126752 and 5P30CA125123 and Leukemia and Lymphoma Society (LLS) Specialized Centers of Research (SCOR) grant 7018.